There are thousands of universities in the United States and deciding which sociology programs to apply to can be intimidating for international students. The United States is a large country with a varied landscape, climate and culture. As there are good programs throughout the United States, one important consideration for deciding where to study is whether the university is located in an area that the individual student would feel comfortable. When deciding where to study sociology in the US, international students will probably have several features in mind to help them decide which university is right for them. As the US is a large country with thousands of universities, one important feature to consider is the location of the university. Completing an undergraduate degree in sociology should take around four years and completing a graduate degree can be even longer. International students should apply to universities in regions of the US that they will find most enjoyable or comfortable to live in. The states of Maine, New Hampshire, Vermont, Massachusetts, Rhode Island and Connecticut comprise the region of New England. The borders of New England are the Atlantic Ocean (on the east), Canada, and the state of New York. New England contains rolling hills, mountains, jagged coastlines and seaboard lowlands. New England has four full seasons: mild summers, bright and colorful falls, wet and cloudy springs and snowy winters. The largest city is Boston, Massachusetts with 617,594 residents. One of the legacies of New England is education and many of the best universities in the US can be found in this region. Some of the best universities to study sociology in New England are Harvard University, Yale University, Brown University, University of Massachusetts – Amherst, Boston College and Brandeis University. The Mid-Atlantic region of the US is comprised of Delaware, Maryland, New Jersey, New York, Pennsylvania and Washington, D.C. This region is considered to be the bridge between the North and the South and has more ethnic diversity than many other regions in the US. It contains many large cities including New York City, Philadelphia, Baltimore, Pittsburgh and Washington, D.C. The Mid-Atlantic region tends to have mild springs, hot and humid summers, brisk falls and cold winters. International students who enjoy studying in an urban environment should consider Columbia University or The New School	which is located in New York City. Some of the best options to consider taking sociology classes in the Mid-Atlantic region are Princeton University, University of Pennsylvania, Cornell University, Pennsylvania State University, University of Maryland – College Park, Johns Hopkins University, and Rutgers University. The South is a varied region containing Alabama, Arkansas, Florida, Georgia, Kentucky, Louisiana, Mississippi, North Carolina, South Carolina, Tennessee, Virginia, and West Virginia. These states have a distinct culture (music styles and cuisine). The climate in the south includes hot summers and mild winters with moderate precipitation year round. International students should be aware that are significant differences in climate in states that comprise the south: for example, while parts of Virginia experience snowfall, Florida has considerably milder winters. The south contains the following universities considered to be in the top 50 programs for sociology in the US: University of Virginia, University of North Carolina – Chapel Hill, Duke University, Vanderbilt University, Emory University, Florida State University, University of Florida, North Carolina State University and University of Georgia. Arizona, New Mexico, Oklahoma and Texas make up the region known as the Southwest. The Southwest contains cities as well as desert and wide, open spaces. The Southwest is the home of the Grand Canyon, Monument Valley, Carlsbad Caverns and many other national parks. The climate in the southwest depends greatly on the elevation of the area. Lower elevations tend to have an arid desert climate with very little snow, while higher elevations have alpine climates with a significant amount of snowfall. On average, the southwest has hot summers and mild winters. The best schools for international students planning on studying sociology in the southwest are University of Texas – Austin, University of Arizona, Texas A & M University, and Arizona State University. The Mid-West is divided into two sub regions. The Great Lake states include Michigan, Ohio, Indiana, Illinois, Minnesota and Wisconsin, and the Great Plains states include Iowa, Missouri, North Dakota, South Dakota, Nebraska, and Kansas. States in the Mid-West are moderately dry with most of the rain occurring in the early summer. The Mid-West also experiences four full seasons with pleasant late springs and summers and harsh winters. The Mid-West is considered to be the "bread basket" of the US as it contains some of the richest farmlands in the world. The Mid-West also includes large urban areas, e.g. Chicago. Mid-westerners are considered to be open, friendly and straight-forward people. Some of the best universities to consider in the Mid-West for sociology are University of Wisconsin – Madison, University of Michigan – Ann Arbor, University of Chicago, Northwestern University	, Indiana University – Bloomington, and Ohio State University. The Western United States includes Alaska, Colorado, California, Hawaii, Idaho, Montana, Nevada, Oregon, Utah, Washington and Wyoming. The West is known for its scenic beauty and large amounts of undeveloped land. International students who enjoy fishing, camping, hiking and boating should consider taking sociology classes in the West. Even urban areas like San Diego, Los Angeles, and San Francisco are only a short drive from national and state parks. The climate varies considerably in these states, so students should do some research on the location, including climate and elevation, of the universities they are interested in applying to. 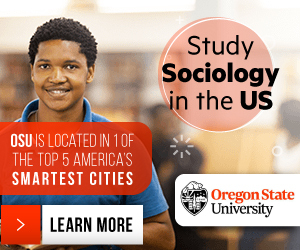 The best schools for studying sociology in the West are University of California – Berkeley, Stanford University, University of California – Los Angeles, University of Washington, University of California –	Irvine, University of California – Santa Barbara, University of California – Davis, University of California – San Diego, and Washington State University. There are many factors that an international student should consider when deciding where to study sociology. As you can tell, there are a number of competitive universities throughout the US to take sociology classes, so students have a large number of options depending on what they are looking for. If you are an international student, think about what you want to get out of your education, what type of experience do you want to gain outside the classroom, and begin your adventure of studying sociology in the US!